Gout is a type of arthritis. It occurs when uric acid builds up in blood and causes inflammation in the joints. Acute gout is a painful condition that often affects only one joint. Chronic gout is the repeated episodes of pain and inflammation. More than one joint may be affected. When uric acid builds up in the fluid around the joints (synovial fluid), uric acid crystals form. 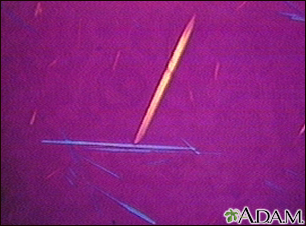 These crystals cause the joint to become inflamed, causing pain, swelling and warmth. The exact cause is unknown. Gout may run in families. The problem is more common in men, in women after menopause, and people who drink alcohol. As people become older, gout becomes more common. Gout may occur after taking medicines that interfere with the removal of uric acid from the body. People who take certain medicines, such as hydrochlorothiazide and other water pills, may have a higher level of uric acid in the blood. Only one or a few joints are affected. The big toe, knee, or ankle joints are most often affected. The pain starts suddenly, often during the night. Pain is often severe, described as throbbing, crushing, or excruciating. The joint appears warm and red. It is usually very tender and swollen (it hurts to put a sheet or blanket over it). There may be a fever. The attack may go away in a few days, but may return from time to time. Additional attacks often last longer. People will have no symptoms after a first gout attack. Many people will have another attack in the next 6 to12 months. Some people may develop chronic gout. This is also called gouty arthritis. This condition can lead to joint damage and loss of motion in the joints. People with chronic gout will have joint pain and other symptoms most of the time. Deposits of uric acid can form lumps below the skin around joints or other places such as the elbows, fingertips, and ears. The lump is called a tophus, from Latin, meaning a type of stone. 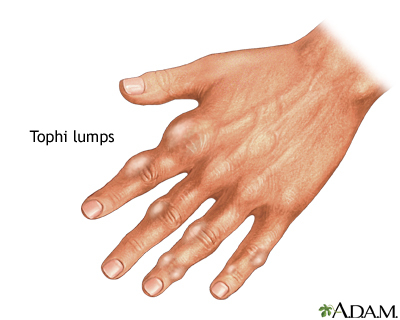 Tophi (multiple lumps) can develop after a person has had gout for many years. These lumps may drain chalky material. A synovial biopsy is the removal of a piece of tissue lining a joint for examination. The tissue is called the synovial membrane. A uric acid level in the blood over 7 mg/dL (milligrams per deciliter) is high. But, not everyone with a high uric acid level has gout. Take medicines for gout as soon as you can if you have a sudden attack. Take nonsteroidal anti-inflammatory drugs (NSAIDs) such as ibuprofen or indomethacin when symptoms begin. Talk to your health care provider about the correct dose. You will need stronger doses for a few days. A prescription medicine called colchicine helps reduce pain, swelling, and inflammation. Corticosteroids (such as prednisone) can also be very effective. Your provider may inject the inflamed joint with steroids to relieve the pain. The pain often goes away within 12 hours of starting treatment. Most of the time, all pain is gone within 48 hours. You may need to take daily medicines such as allopurinol (Zyloprim), febuxostat (Uloric) or probenecid (Benemid) to decrease the uric acid level in your blood. You have several attacks during the same year or your attacks are quite severe. You have damage to joints. You have kidney disease or kidney stones. Decrease alcohol, especially beer (some wine may be helpful). Limit your intake of red meat and sugary beverages. Choose healthy foods, such as dairy products, vegetables, nuts, legumes, fruits (less sugary ones), and whole grains. Coffee and vitamin C supplements (may help some people). Proper treatment of acute attacks and lowering uric acid to a level less than 6 mg/dL allows people to live a normal life. However, the acute form of the disease may progress to chronic gout if not treated adequately. Deposits in the kidneys, leading to chronic kidney failure. High levels of uric acid in the blood are associated with increased risk of kidney disease. Studies are being done to find out whether lowering uric acid reduces the risk of kidney disease. Call your provider if you have symptoms of acute gouty arthritis. You may not be able to prevent gout, but you may be able to avoid things that trigger symptoms. Taking medicines to lower uric acid can prevent progression of gout. Burns CM, Wortmann RL. Clinical features and treatment of gout. In: Firestein GS, Budd RC, Gabriel SE, McInnes IB, O'Dell JR, eds. Kelley's and Firestein's Textbook of Rheumatology. 10th ed. Philadelphia, PA: Elsevier; 2017:chap 95. Edwards NL. Clinical gout. In: Hochberg MC, Silman AJ, Smolen JS, Weinblatt ME, Weisman MH, eds. Rheumatology. 6th ed. Philadelphia, PA: Elsevier Mosby; 2015:chap 188. FitzGerald JD, Neogi T, Choi HK. Editorial: do not let gout apathy lead to gouty arthropathy. Arthritis Rheumatol. 2017;69(3):479-482. PMID: 28002890 www.ncbi.nlm.nih.gov/pubmed/28002890. Khanna D, Fitzgerald JD, Khanna PP, et al. 2012 American College of Rheumatology guidelines for management of gout. Part 1: systematic nonpharmacologic and pharmacologic therapeutic approaches to hyperuricemia. Arthritis Care Res (Hoboken). 2012;64(10):1431-1446. PMID: 23024028 www.ncbi.nlm.nih.gov/pubmed/23024028. Khanna D, Khanna PP, Fitzgerald JD, et al. 2012 American College of Rheumatology guidelines for management of gout. Part 2: therapy and antiinflammatory prophylaxis of acute gouty arthritis. Arthritis Care Res (Hoboken). 2012;64(10):1447-1461. PMID: 23024029 www.ncbi.nlm.nih.gov/pubmed/23024029. Chronic symptoms such as joint deformity and limitation of motion in affected joints may occur if several attacks of gout occur each year. Uric acid deposits called tophi develop in cartilage tissue, tendons, and soft tissues. These tophi usually develop only after a patient has suffered from the disease for many years. Deposits also can occur in the kidneys, leading to chronic renal failure.